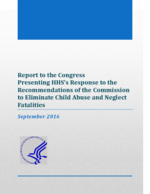 This statutorily mandated report to Congress responds for the U.S. Department of Health and Human Services to the many recommendations contained in the March 2016 final report of the Commission to Eliminate Child Abuse and Neglect Fatalities. Overall, HHS heartily embraces the Commission's vision for a robust response to families in crisis: one that intervenes early to prevent maltreatment and strengthen families whenever possible, but also protects children aggressively as needed. This report describes HHS's overall vision for improvements to the federal infrastructure of policies and programs most directly related to protecting children from maltreatment and, ultimately, serious injury or death. We identify areas in which our vision specifically overlaps with the Commission's recommendations. In addition, a chart in the appendix responds briefly to each of the Commission's individual recommendations affecting this Department.